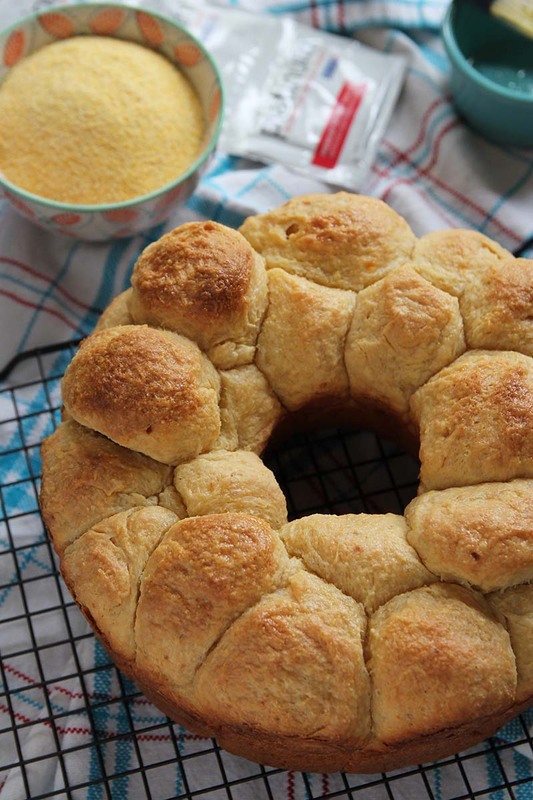 A marvelous pull-apart bubble loaf that can be made the day before, refrigerated overnight and baked before serving. Great for summer barbecues or serve with hearty winter soups. In large mixer bowl, combine 1½ cups flour, yeast, cornmeal, sugar and salt; mix well. In saucepan or microwave-safe bowl, heat milk, water and 2 Tbsp butter until warm (120-130°F; butter does not need to melt). Add to flour mixture. Blend at low speed until moistened; mix 3 minutes at medium speed. By hand, gradually stir in cheese and enough of the remaining flour to make a firm dough. Knead on floured surface 5 to 8 minutes until smooth and elastic. Place in greased bowl, turning to grease top. Cover; let rise in warm place until double, about 1 hour. Punch down dough and turn out on lightly floured surface; divide into 4 parts. Divide each fourth into 10 pieces. Shape each piece into a smooth ball; dip in melted butter. Place in greased 10-inch solid bottom tubed cake pan or a 12-cup Bundt® pan. Cover; refrigerate 2 to 24 hours. Bake at 375°F for 55 to 60 minutes until golden brown. Remove from pan; brush with butter. Serve warm.